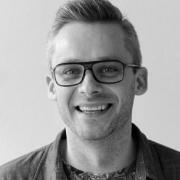 Having a background in psychology and communication science Rimantas started his advertising career in Leo Burnett, where he learned not only the basic skills, but also assimilated certain values reflected in Leo’s philosophy of Humankind. It helped him to grow, but not to become cynical of the industry. Throughout the years he has worked above, bellow and trough the line on all sorts of accounts. From chewing gum to banks. According to Rimantas this is one of the biggest perks of being a creative in a small agency in a small market. Since 2007 he has been working as a copywriter and a creative director at an independent agency Milk, where he is perfecting the classical method of trial and error. Hopefully not all of it is error.